I have a 96 geo tracker 4door m/t. I took off very quickly from a stop. Car stalled. No lights del or otherwise. Now, that i'm home I'm trying to diagnose the problem. my fuel pump will not run(or prime), suspecting ecm or wiring problem. ECM triggers main at key on and sends power to fuel pump relay and ecm on blue black wire. When testing the pink wire, it goes to 12v at key on, but does not close the relay. 0v to pink/black. When the fuel pump relay is disconnected the pink wire shows 4.65v for three seconds then goes back to 0v. continuity good between ecm and relay on pink wire. 5v reference on tps wire. All fuses good and 12v on both sides of fuses and 12v back probing wires at fuse box. Cel light is on with key. Starts and runs good with fuel pump directly supplied 12v with fuse and switch. No hesitation or miss. I also Grounded ecm case with copper stranded wires and loop connectors. Pulled ecm and inspected for damage-none seen obvious to the eye. No heat, water, corrosion evidence obvious. I see several posts saying that the pink wire is supposed to supply a ground for three seconds at key on. How to test this ? Can I back probe the pink wire with the negative side of my metre and put the (red)+ side of my meter to 12v positive. With relay removed pink wire shows 4.65v for three seconds at key on. (Positive of meter to pink wire, negative to body ground) Is this correct? If not what should the reading be? If the results of these tests is showing the ECM is cutting fuel, what faults can cause this condition? Anyone with more experience is welcome to ignore my questions and provide further diagnosis procedures. Sorry for the lengthy post I wanted to provide as much information as possible. If I get this resolved I will return to share the cause. FP not priming for three seconds, or at key on. Power to do relay where it should be. Seeing 4.65v at ecm pin for three sec at key on the 0v with relay disconnected. 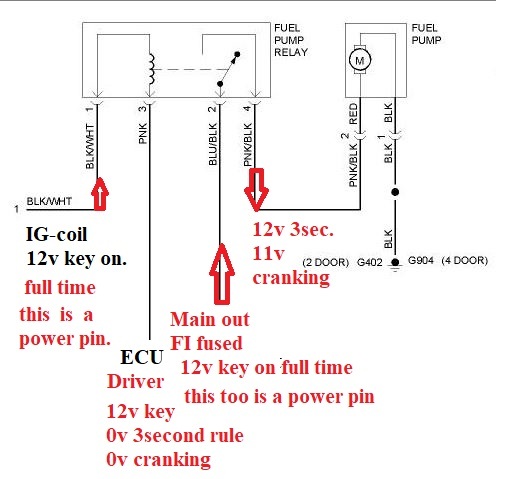 12v at key on (all times with relay connected) tells me that the ecm is commanding the relay open(no power to fp) I've read that it should read 0v to trigger the fuel pump and then float to 12v when commanded off. Why would the ecm cut fuel at prime, before start? No how to diagnose from here. 96 are slightly different animals than most. some of old dogs sleep. this is real easy , basic, electrics. wires can open, or short. I use amp meter to read pump current 4 amps good 10 bad. 15 bat, more than that the fuse blows. no the 96 is same as 91, to 98 generations in how it works. 96 they moved the fuel pump relay to heater box, and you can swap relays there, seen with same P/N sure can. the 4 pins are here. blk/wht = IG-coil fuse 12vdc, all the time. key on, power. blu/blk= main relay out, 12vdc keyon, all the time key on, if not ECU goes dead. this is FI fuse. if 0v. FI blew, or main relay bad. pink-bk - runs the pump that is all it does and gets its power from main out. 12vdc. Seeing 4.65v at ecm pin for three sec at key on the 0v with relay disconnected. (what Pin what color wire) my wild guess, is the solid pink wire, relay to ECU? i do not have enough data from you,. on pump relaypin volages, for 3 second key on, all 4 pins matter for that 3 second, test. 4.6v is bad, for any key on event. what do all pins read when you saw, 4.6v, key on for 3 seconds. 1: the pumps can and do short. 2: when 1 happens and say 14amps flow, (partial shorts happen or say OVERLOAD inside pump) this overloads the ECU power feed, causing ECU go nuts. 4.6v = NUTS. you overload the blu/blk= main relay out wire. when any FP relay fails, measure all 4 FP relay pins key for 3 seconds then after. if you see main voltage drop, that is pump short or battery dread or cracked FI fuse. which I had the basics first. does car start and run, my guess n0. does the starter crank fast and rubustly and normally, Y/n? if how ever cranking is ok, (100 amps the starter uses ) so that is more that enough to run any 4 amp fuel pump, for sure. this is because the wires used are tiny. The ECU can even chatter relays like mad with near shorted fuel pump. pink- 0v or 12v are only valid here, never 5v ever. if you see 5v (4.64 = 5v) then below is wrong volts. i can get by just knowing 4 voltages above, key on 3 second long time. just at prime time, what do you read for 3 seconds. those 4 voltages are prime data. 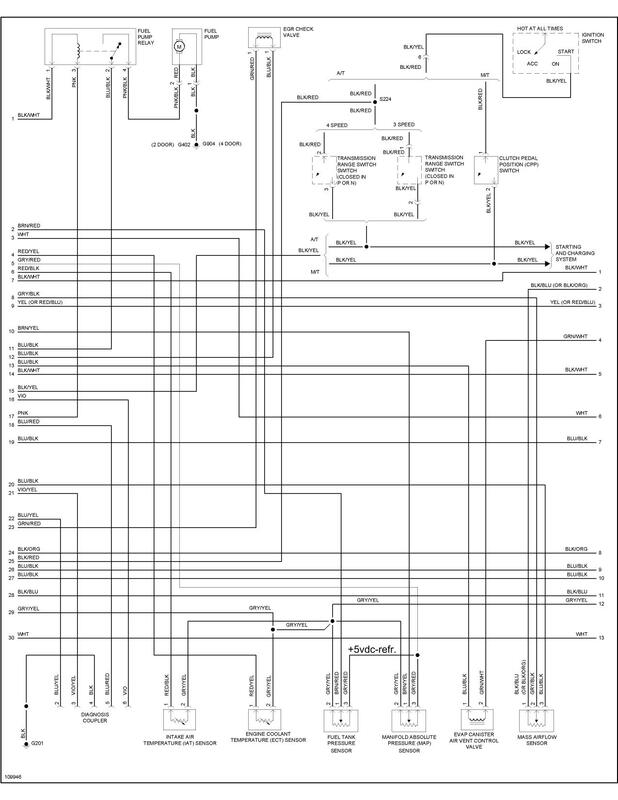 and the ECU goes nuts (chatters relays) ecu goes dead, 5vdc will never run any ECU made ever. ok? if test 1 fails the pump is shorted, if the battery reads 10v cranked. use a dmm meter, for all tests. during the 3 second period of key just turned off to on. this is the best way to find the cause, bar none. check pin 2 above, if that is weak too (5v) and same voltage, weak, the PUMP is shorted or wires to it are. if you crank the engine, pin 3 goes to 0v full time cranking, so the engine can inject full. battery cranking voltage is near that, 10v to 11, if not fix bad power first. Car runs good only witg test fuel. Also runs good with fuel pump relay (pink black) directly wired to battery+ with FP relay removed. Means relay is not working, or passing power to fuel pump. No click felt it heard. No fuel pump prime. Quote: Seeing 4.65v at ecm pin for three sec at key on the 0v with relay disconnected. (what Pin what color wire) my wild guess, is the solid pink wire, relay to ECU? Because the relay was not working, I removed the relay and tested continuity on the pink wire(pin) from ECM to Fuel pump relay. Meter shows good continuity. I will go to the car now and test Fuel pump Relay voltages with key off, key on for three seconds, and after. Thank you for your knowledge, experience and willingness to share. I have used your site, schematics, and forum advice to others for years. Fixed many cars with help from your pages and posts. I have swapped relays, main and FP. Fuel pump relay works correctly in main relay socket. I have also swapped for another good relay. Relay seems good. Why 12v at pink ECM wire, but no power to pink/black. (if Pink is dead, so will be pink/blk so will be pump dead. the above PINK not keying the relay means, ECU is failing. only why remains. ECU tests, (key on CEL must GLOW Does it?) if not ECU is dead or power pins to ECU are dead. The CEL = cluster check engine lamp MUST GLOW KEY ON, does it.? if not power to ECU is missing. question 2, Are the wires in the car, to ECU or EFI hacked ? (see wires cut or transgressed upon ? from stock)? inspections are very easy and effective if ECU malfs. i annotated each pin, to show what voltage are there. C2 , see power and ground here? connect meter minus black lead, to battery negative LUG (jumper test lead wire,), for best readings. then probe with red meter probe (20vdc range) to the ECU pins key on. sniff sniff for smells of burned things. look at Q106 , is it burned or cracked? Q106 is FP relay driver transistor on board. look next for bulging or cracked/leaking, large (can shaped) CAPS. in the HTML link above i have photo of ECU PCB, see Red X on top of 3 caps that like to leak, top left is prime suspect. crash and burn. fuel fires. the tool will show CEL status on or off, the lamp really is not important now, the scan tool answers that exhaustion, first. when did car fail driving down road?? 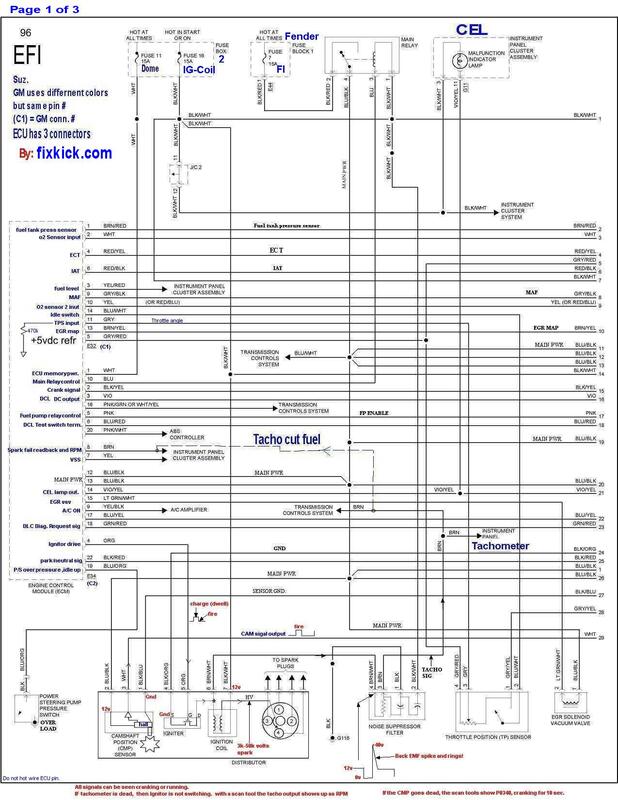 or parked in drive way or garage or after rewiring things in car ECU died, history can help here. if car was molested, we inspect all wiring carefully for transgressions, (stock wiring good, not stock bad) splices, to wires? bad, see tape balls, or liquid tape balls on wires, bad. make sure the TPS on the throttle body, see 4 wires to that sensor there make darn sure the wires are not cut, damaged, and the TPS is not cracked and damaged. until you check its wiring for damage. and check power pins. (power and ground) power is12v ground is 0vdc. and scan it. never skip this critical step.,. if the ECU can talk it tells you things are wrong, listen to it. (TPS errors DTC )? and TPS voltage on pin 3 seen here. pin 3 is 1vdc. key on, not near 4v or 5. 1volt means throttle angle is zero . pin 1 TPS, if that wire breaks, the ECU sees that as endless, unflood mode and injection stops and even the pump goes off line. but injections END NOW. Quote: I took off very quickly from a stop. Car stalled. No lights Cel or otherwise. (i edited DEL to CEL) sure CEL dead, the fuse blue, ecu is now dead. Quote: Checked fuses. IG-coil fuse was blown. Relays chattering. (that symptoms means ECU sees power feed overloaded in fact voltage power is below 9vdc. bad. Fuel pump would not energize. the battery has 500 amps on tap, so can blow .1amp transistor , 5000 times over. BOOM silicon is now carbon and air. id test the pump FP relay removed, hot wire the pump and measure its current, if over 4 amps, the pump is bad and was the day one failure cause.